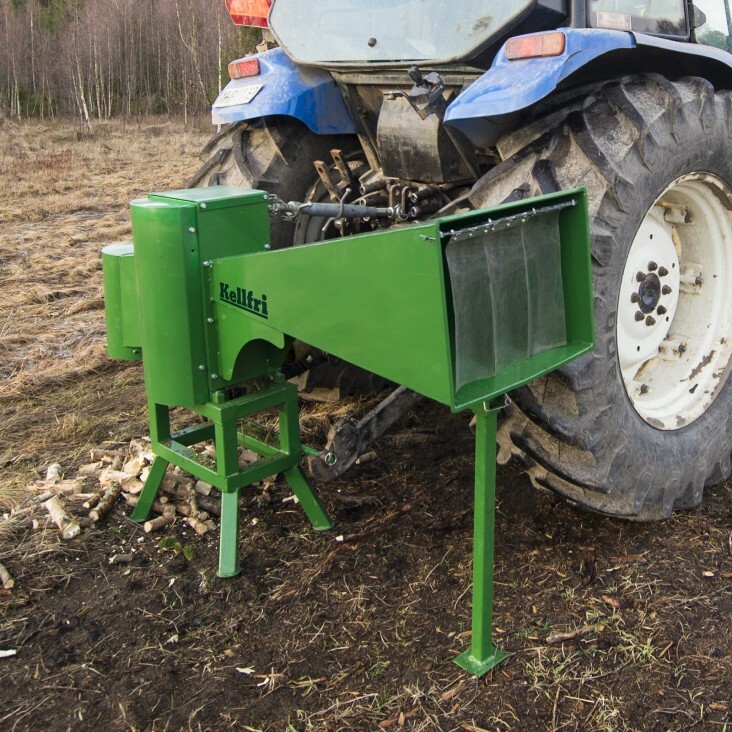 Highly efficient, fast and simple<\/h3>This firewood chopper is the only one of its kind \u2013 it offers high efficiency converting logs into firewood in just a few seconds. A log 3 metres long and about 10 cm thick is turned into firewood in just 3 seconds. It is the only model on the market that cuts the wood with a guillotine optimally designed to cut the wood into several pieces. You decide on the length yourself, up to 25 cm. The firewood chopper can handle trunks 10 cm thick, and the power requirement varies according to the type of wood. For birch, for example, 50 hp is sufficient. The firewood chopper is fitted with a protective cover for protection against wood chips. Simple design \u2013 you can open the side of the gearbox for servicing etc. Thanks to the firewood chopper's long hopper and its stability on the ground, you can work quickly and safely. This firewood chopper is the only one of its kind – it offers high efficiency converting logs into firewood in just a few seconds. A log 3 metres long and about 10 cm thick is turned into firewood in just 3 seconds. The firewood chopper is fitted with a protective cover for protection against wood chips. Simple design – you can open the side of the gearbox for servicing etc.